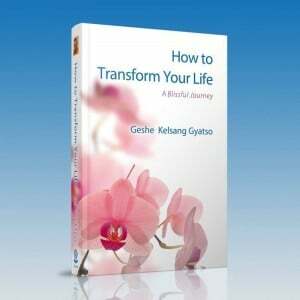 Through practising the instructions presented in this book we can transform our life from a state of misery into one of pure and everlasting happiness. These instructions are scientific methods to improve our human nature. Everybody needs to be good-natured with a good heart, because in this way we can solve our own problems as well as those of others, and we can make our human life meaningful. Over many years Venerable Geshe Kelsang Gyatso Rinpoche has tirelessly refined the presentation of Kadampa Buddhism to bring greater benefit to modern society. With each careful revision, his books guide the reader to experience more deeply the profound meaning of Buddha’s wisdom advice, empowering people everywhere to overcome suffering and find real meaning in their lives. How to Transform Your Life is a brand-new manifestation of one of Venerable Geshe-la’s most popular and accessible books. By including new material and making over 600 revisions he aligns the presentation of Kadampa Buddhism perfectly with the needs and inclinations of people today. Prepare to immerse yourself in How to Transform Your Life and open the door to your own blissful journey.